Eating a plant-based diet doesn't mean skimping on flavor or not feeling satisfied and satiated. 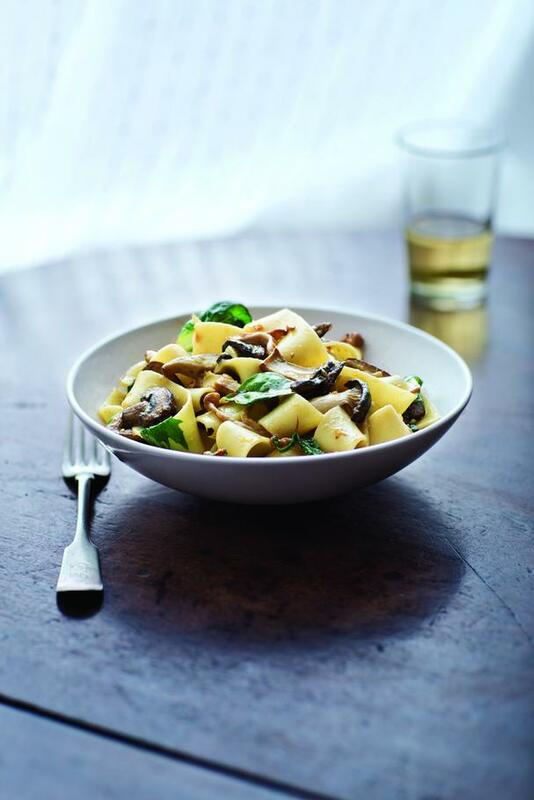 We simply love this healthy pasta recipe from Veronica Bosgraaf, founder of The Pure Bar. In her new cookbook, The Pure Food Cookbook, Veronica features easy, clean and seasonal plant-based recipes the whole family will enjoy. This dish is packed with goodness the whole family with love: buttery egg noodles, spring greens, and mushrooms that are sautéed with onion vegetable broth, white wine, and a bit of flour to thicken the sauce. It's simply seasoned with salt and pepper and a bit of shaved Parmesan cheese (or nutritional yeast if you're vegan). In a medium pot, bring 6 cups of water to a boil over high heat. Add the egg noodles and 1 teaspoon salt, reduce the heat to keep the water at a low boil, and cook until the noodles are done, about 10 minutes (or cook according to the package directions). Drain the noodles and transfer to a large serving bowl. Stir in greens. Cover and let sit for 2 minutes. Meanwhile, in a large skillet set over medium-low heat, combine the olive oil, flour, mushrooms, and onion. Cook, stirring, until the mushrooms and onion are soft and lightly browned, about 10 minutes. Slowly add the vegetable broth and white wine and cook, stirring constantly, until the mixture begins to thicken, 3 to 4 minutes. Season with salt and pepper, and remove the pan from the heat. Pour the mushroom mixture over the noodles and greens and toss to coat. Drizzle with olive oil and top with shaved Parmesan.